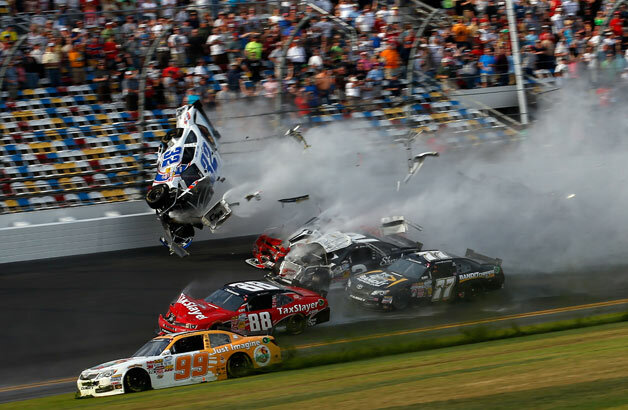 At least 25 NASCAR fans were injured Saturday when large chunks of debris, including a tire, sailed into the grandstands when a car flew into the fence at Daytona International Speedway on a frightening last-lap accident in the second-tier Nationwide Series race. The accident happened on the last lap of the second-tier Nationwide Series race on the eve of Sunday's Daytona 500, which officials said would go on as scheduled. Larson’s car was flipped upside-down into the fence during a frightening melee on the final lap. No fatalities were reported at either hospital. Cogdell said two people taken to the Halifax in Daytona Beach arrived in critical condition, and one of those had life-threatening injuries, but both are considered stable. Watch the horrifying Video inside.